On Monday 14 May 1917, a group of naval ratings drew a motor car through the streets of Hackney. Inside was Petty-Officer Philip Henry Baker and his bride Ethel. Philip Baker was born in Bromley-by-bow in 1892, the son of Alice and ‘blind-house fitter’ Henry. Ethel Kain was 5 years his junior, daughter of undertaker Thomas Kain. 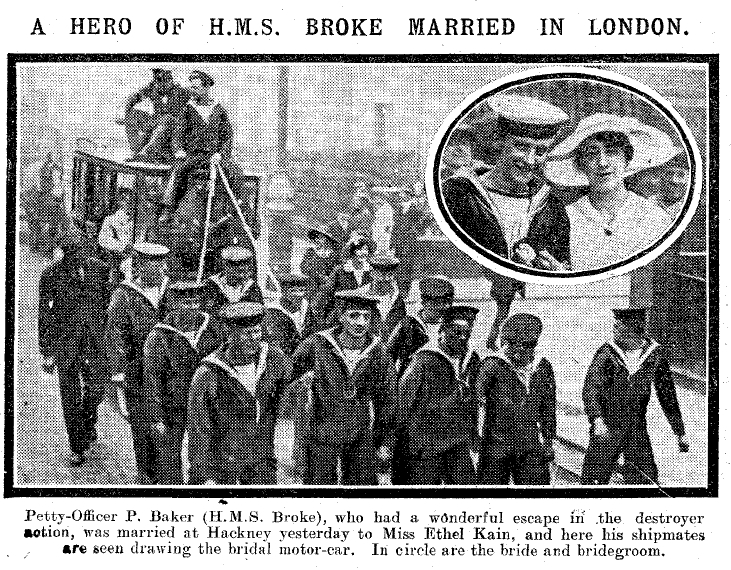 As Petty-Officer Baker, Philip was serving as a stoker on HMS Broke, and was involved in the Battle of Dover Strait the month before his wedding. Along with another ship, the Broke attacked German torpedo boats that had shelled Calais and Dover. Both British ships rammed German vessels. The commanders and many of the men on the two British ships were awarded medals for their actions (although Baker was not among them). On 14th May, Philip Baker was back on dry land to marry Ethel at St John-at-Hackney church. 1918 was a bad year for Annie Bridger. She was doubly bereaved, but also suffered the pain of uncertainty about her husband’s fate. Annie grew up in Wandsworth, the daughter of a labourer – the second-youngest of Charles Henry Langley’s children with his wife Mary Ann. The family lived at 27 Garton Street, off Allfarthing Lane. The 1911 census records five of the children still living at home, 14-year-old Annie was a laundry apprentice, presumably working with her older sisters Louise (21) and Elizabeth (19) who were laundry workers. Two sons were also living in the house: 16-year-old James, working as a railway porter, and schoolboy Walter. Sometime in the spring of 1914, Annie became pregnant by (I presume) Walter Bridger, a shop assistant two years her senior who lived in nearby Aslett Street. Annie and Walter married in the parish church on 13 September, just at the point when men like Walter (young men in the service sector) were enlisting in the army in vast numbers. On Christmas Day, 1914, their daughter Violet Bridger was born. The following summer, Walter left his wife and daughter behind in Wandsworth and joined the London Regiment – on 14 June 1915. Another nine months later Annie gave birth to their second child – Walter Charles Henry Bridger. Annie’s wartime address is given variously as 53 Garton Street, 7 Aslett Street (Walter’s parents’ address and his address on his service papers) and 29 Garton Street. Walter had joined the second-line battalion of the 23rd London Regiment, a unit initially formed to keep the first-line battalion (the Artists’ Rifles) up to strength. A year after Walter had joined up, though, the battalion went out to France in the 181st Brigade, 60th (2/2nd London) Division, before going on to Salonica that December, and on to Egypt in June 1917. In April 1918, Annie received a War Office telegram bringing terrible news – her husband was reported missing in action. His unit had been engaged in the First Battle of Amman at the end of March, fighting around the River Jordan. The 60th Division suffered 476 casualties, of whom over 100 were killed or missing. One of them was Walter Bridger. I am writing these few lines to you to tell you I have heard some good news about my husband which may please in one way my father saw a gentleman who he new and he said he son wrote home and told him that my husband was taken prisoner of war with one of there fellow mates he saw him taken. Father said the name of the son father was Williams who told father to tell me as he was comeing to my house to show me the letter but has he see dad he told him so I thought it would be best to write and tell you as might find out some time or other about my husband to see if it is right. Sadly, the rumour – as so often in these cases – was not true, or if he was a prisoner it was never officially reported. Walter’s body was never found and his death was officially recorded in January 1919 to have happened on or after 28 March 1918. Before finding this out, though, more sad news hit Annie and her family. Her two youngest brothers had also enlisted in the army during the war. James, the older sibling, had joined up early in the war and went out to France in March 1915 in the RAMC; he served in the 4th London Field Ambulance. Walter was conscripted in December 1916 and joined the 7th Battalion, Royal Fusiliers. Walter was wounded during his time in the army and was awarded the Silver War Badge to mark his injury. James Langley some how ended up in a series of Yorkshire units in the last 18 months of the war – in the 1st West Riding Field Company (Royal Engineers), the East Yorkshire Regiment, and finally the 1/6th West Yorkshires as they fought the Germans back across France in autumn 1918. On 11 October – exactly a month before the Armistice – James was killed in action near Iwuy, where his body now lies in the Commonwealth War Graves Cemetery. We can only wonder at the feelings of the Langleys and Annie Bridger when they received this news, and how they greeted the Armistice that ended a war that had so recently taken away James, wounded Walter Langley, and still held Walter Bridger in limbo. Individual circumstances had such a great impact on people’s attitudes to the war. How did Annie, her parents, siblings, and children feel about this war and the men who were taken or scarred by it? How did they remember Walter Bridger – missing so far away and presumably completely unknown to his son Walter and virtually so to Violet? We tend to think of families in the Great War in terms of the service of the sons, brothers or fathers in the armed forces. They were not necessarily the only ones to play a part, though – many women went to work in munitions or other jobs as more men left civilian life. One example of this is the Holton family who lived in Bermondsey. In 1911, leather finisher James W Holton and his wife Sarah Ann (nee Longhurst) lived at 33 Marcia Road, off the Old Kent Road, with seven of their children, who ranged in age from 11 to 24. They had married on Christmas day 1883 and had a total of 16 children before James died in 1913 (Sadly, seven of their children had died before 1911, another two lived elsewhere). Reginald George Holton, a 14-year-old errand boy in 1911, was working as a warehouseman in 1915 when he went to East Dulwich to enlist in the Royal Field Artillery. He was a 5 feet 4 inches tall, with a tattoo on his right arm. Before going to the front, he got in trouble for going absent without leave for a week in November 1915. Despite his indiscretion, he joined 167 Brigade’s artillery in France as a drvier on 12 December 1915 and remained on the Western Front for the next three and a half years. In May 1916, Driver Holton joined the D battery of 162 Brigade’s artillery. Meanwhile Sarah Holton and her youngest daughter Ethel went to work for John Bell, Hill and Lucas, Ltd, making gas masks in their factory on Tower Bridge Road, Bermondsey. The company were pharmaceutical chemists in peace, so well placed to make gas masks to keep up with the advances in chemicals used in gas warfare in the Great War. They had opened their London Works on Tower Bridge Road in 1909. According to the National Roll of The Great War, Sarah worked in the factory for three years (presumably from 1915 until the end of the war) and was joined there by 17-year-old Ethel from August 1917 until September 1918. In the Holton family – like many others – at least three members took part in the war effort. Reginald drove for the artillery in France and Flanders, while his mother and sisters were making gas masks to counter the gas shells fired by his counterparts in the German artillery. The lasting effect of the Zeppelin raiders that terrorised London in 1915 and 1916 pales into insignificance compared with the damage caused by German bombers a quarter of a century later. Online maps of the two show the difference in scale: a forest of bomb sites from the Blitz compared with a sites few dotted around London in the Great War. However, when they did strike, the air-ships could cause considerable damage. Some of the most destructive Zeppelin raids came in early September 1915, months before the first Zeppelin was shot down over Britain and a full year before British airman started being able to shoot down the raiders. 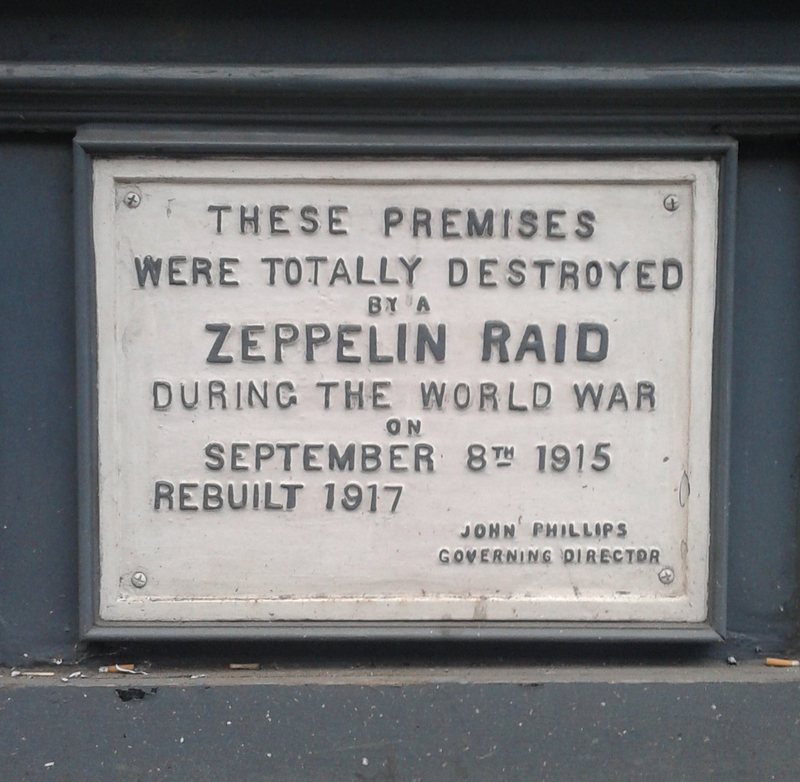 The most successful Zeppelin raid on London in the entire war was on the 8th of September 1915. This raid caused more than half a million pounds of damage, almost all of it from the one Zeppelin, the L13, which managed to bomb central London. This single raid caused more than half the material damage caused by all the raids against Britain in 1915. Among the buildings destroyed was at 61 Farringdon Road in central London. The destruction of the building is marked on the building erected in its place in 1917. Today, the building is called the ‘Zeppelin Building’. This was, of course, not its name in 1915. In the 1915 London street directory, the occupiers are listed as John Phillips (Brass foundry and lamp Co.) Ltd. and West and Price, manufacturing jewellers. Clearly Phillips and Co were better placed to cast the plaque on the building, which bears their governing director’s name. 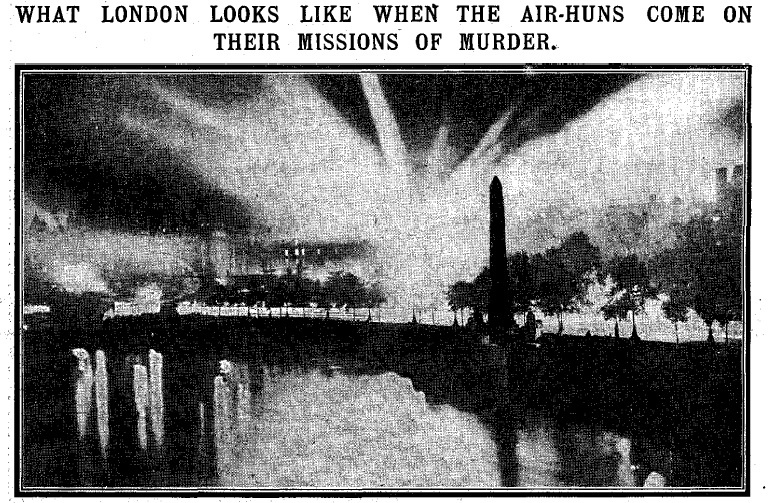 It may be more subtle than the impact of the Blitz and the V weapons, but here and there – as at Cleopatra’s Needle – the German air raids on London left a lasting mark.